Apple is close to unveiling its next iPhones in a few weeks. As rumors start to pop showing different aspects of the device, a lot of information of the device is already revealed before the announcement. This time, a leak from the manufacturing facility of iPhone shows the dimensions of the prototypes upcoming both iPhones. 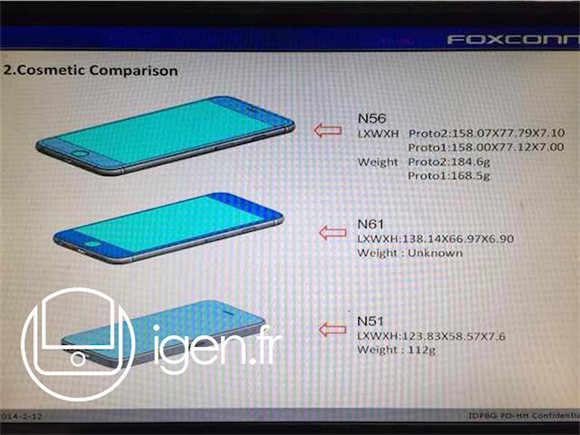 The image above shows 3 devices, iPhone 5S (N51) and two others where are allegedly to be the 4.7” (N61) and 5.5” (N56) versions of the iPhone. It has to be mentioned her that these designs show mention prototypes meaning these images are of the early design phase of iPhone 6. Usually, the design phase comes before the Mass production phase which must have started by now considering how close iPhone launch is. 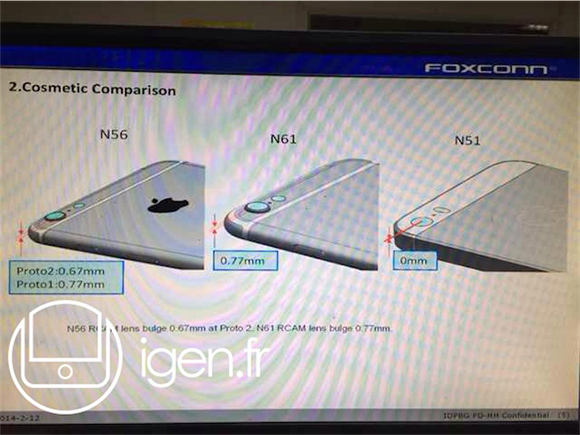 The first thing we can gather from the above picture is that iPhone is set to come with a thickness of 7 mm. The iPhone 5s was a convenient 7.6 mm and extremely wieldy. Further reducing the thickness will definitely enhance the grip. This is a detailed design of the 5.5” inch version (N56). Apple might have been testing two prototypes for the premium iPhone. The first prototype measures 158.0 x 77.12 x 7 mm and 168.5 grams, while the second one comes in at 158.07 x 77.79 x 7.1 mm and 184.6 grams. Both these versions are heavier then the iPhone 5s. 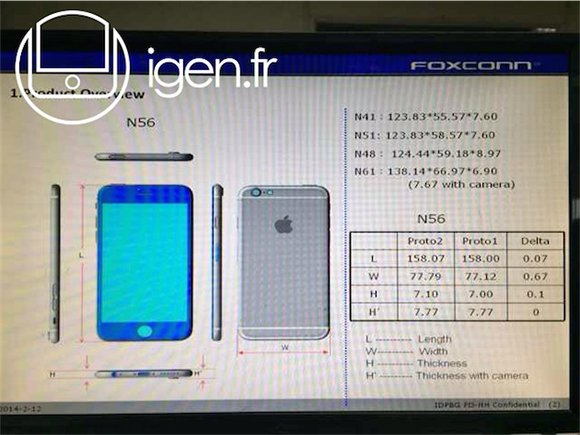 This final image shows the iPhone 6 5.5” and the 4.7” inch versions will have their cameras protruding from the back unlike the iPhone 5s. The thickness will the camera will make the new iPhones with the same as the previous iPhone. The Camera glass will be protected with sapphire glass. iPhone 6 event is just round the corner.